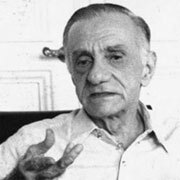 João Cabral de Melo Neto (1920-1999) was a Brazilian poet and diplomat. After moving to Rio de Janeiro in 1942, he published his first collection of poems, entitled Pedra do Sono. In 1947 he was assigned to his first diplomatic post in Spain, where he continued to write. Most of Cabral's life was spent as a diplomat, which afforded him the opportunity to travel the world. Through all of his travels, he continued to write poetry, and at the end of his life, he had published over fifteen collections. He is considered one of the greatest Brazilian poets of all time. In his Encomium speech, then Editor-in-Chief Djelal Kadir said of the poet, “He practices a laconic art of deference in a poetry that curtails its own voice, as well as the ego of its author, yielding to the human context that links poetic vocation with daily life and worldly experience,” (WLT Vol. 66, Autumn 1992). Cabral's body of work includes O Engenheiro (1945, “The Engineer”), O Cão Sem Plumas (1950, “The Dog Without Feathers”), A Educação pela Pedra (1966; tr. Education by Stone, 2005), and Sevilha Andando (1990, “Walking Around Seville”). In addition to his Neustadt Prize, Cabral was honored with the 1990 Camões Prize.